When I went shopping today, I was super excited to see wild caught cod fish on sale. I immediately made my dinner plan for the night. I purchased a pound of the fish along with some fresh green beans and baby heirloom tomatoes. I already had some yellow squash and zucchini at home. 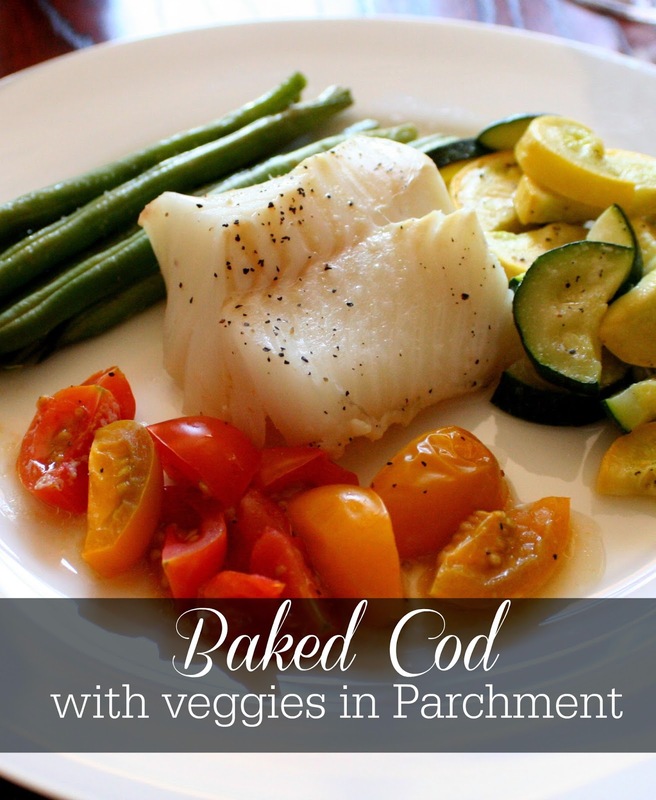 I planned on baking the fish along with the veggies in parchment paper - my favorite way to cook fish. I got home and shared my dinner plan with the hubby. "But I don't like cod fish." - husband. So, I ended up baking just veggies in his parchment package and fixed him a piece of steak. And this is how I prepared my wonderful dinner. I place about a 4 oz. piece of cod fish in the middle of my parchments surrounded by my squash, green beans, and heirloom tomatoes. I then squeezed a little lemon on top of the fish and a sprinkle of salt and pepper over the entire meal. Lastly came a nice sized pat of butter. I closed up the parchment paper by overlapping the 2 sides and then rolling up the ends. I put the package on a baking sheet and popped it into the oven, which had already preheated to 350 degrees. Baking fish in packages like this cooks them perfectly. 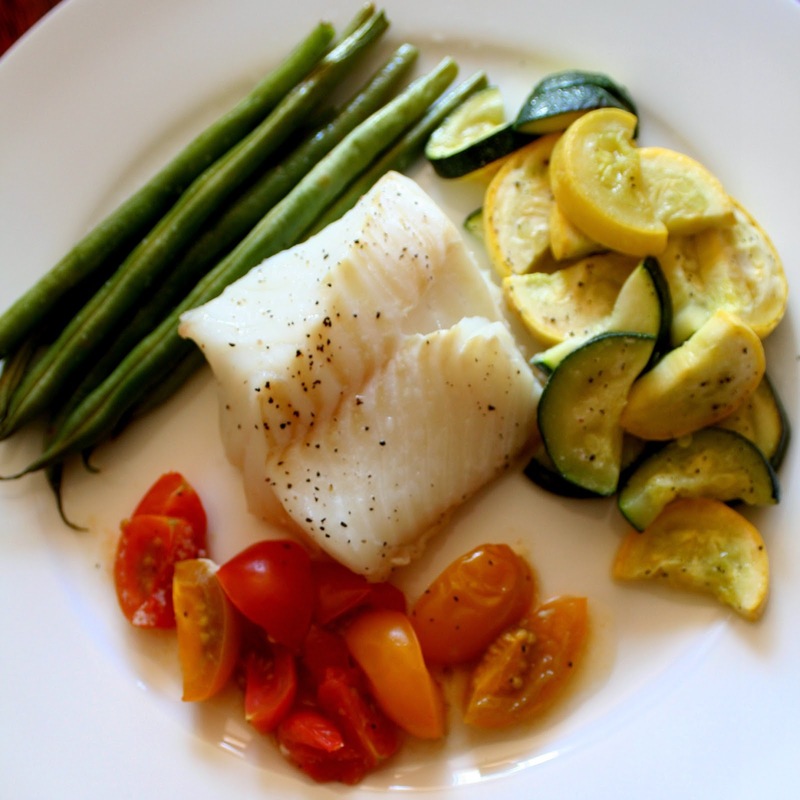 After 20 minutes, my cod fish was moist and flaky while the veggies had steamed wonderfully. My dinner was delicious! The butter had melted right into the fish and that little bit of salt and pepper was just right for the veggies. The whole prep for this meal was less than 5 minutes, and with only 20 minutes in the oven, this dinner was quick, easy, and still elegant. How can he not like cod fish? 1. 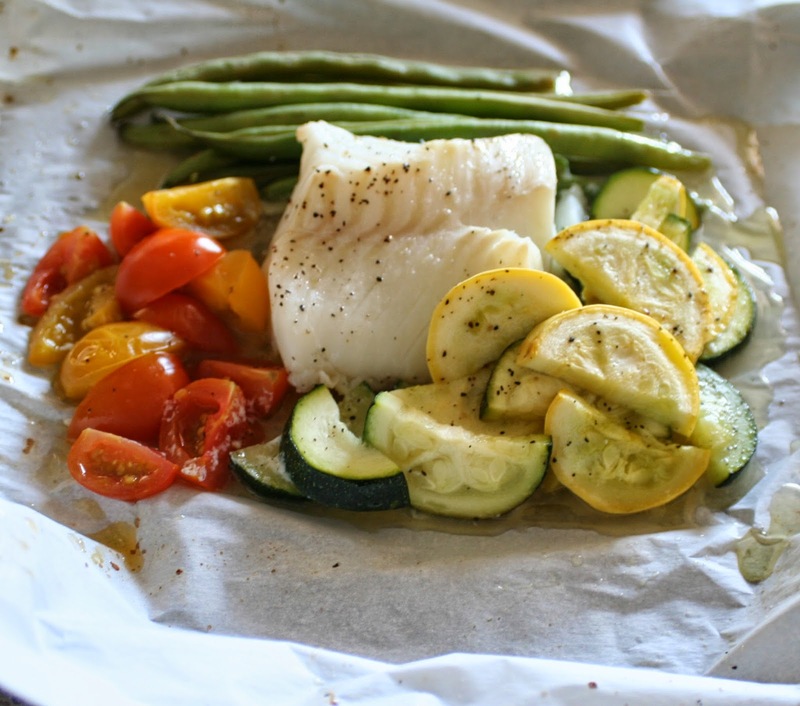 Cut a piece of parchment paper large enough to form a package around the fish and veggies. 2. 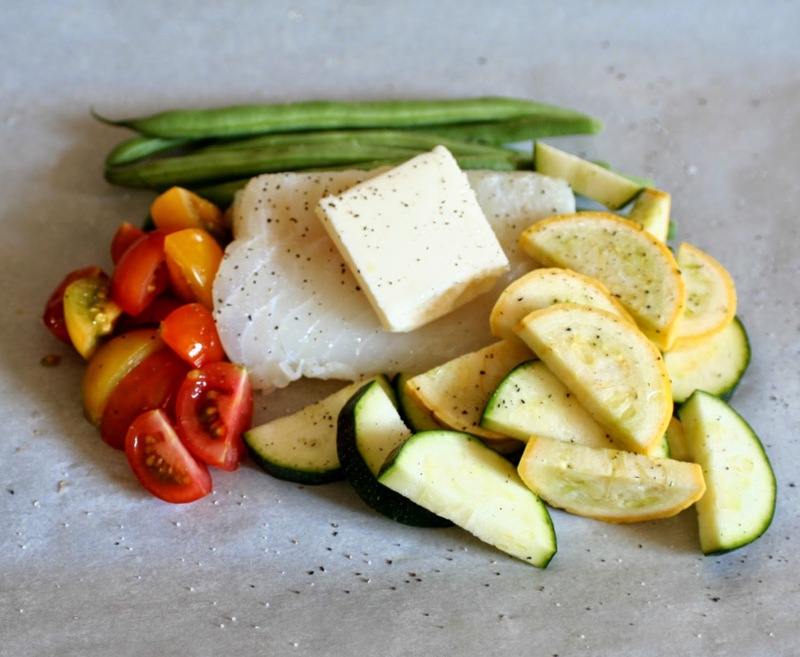 Arrange the fish in the middle of the parchment and surround by veggies of choice. 3. 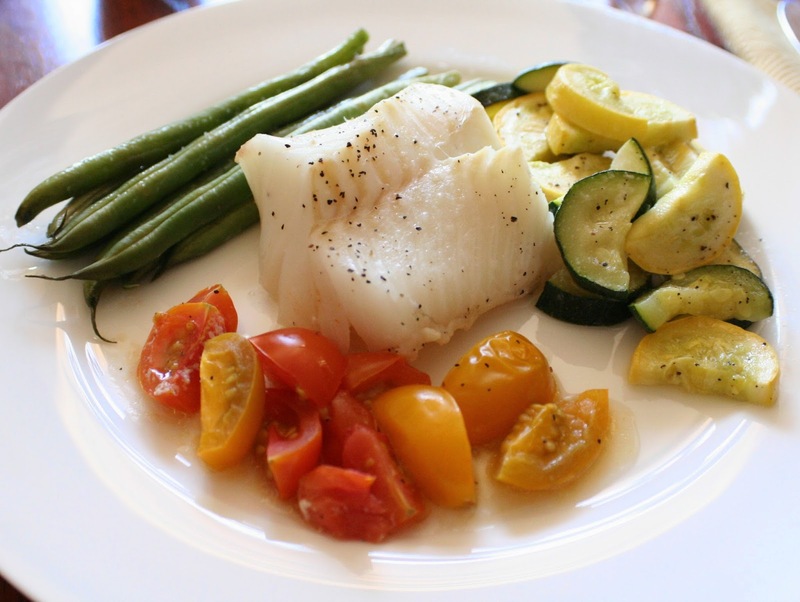 Squeeze lemon over cod fish, and sprinkle salt and pepper over the whole meal. 4. Top the cod fish with the pat of butter. 5. 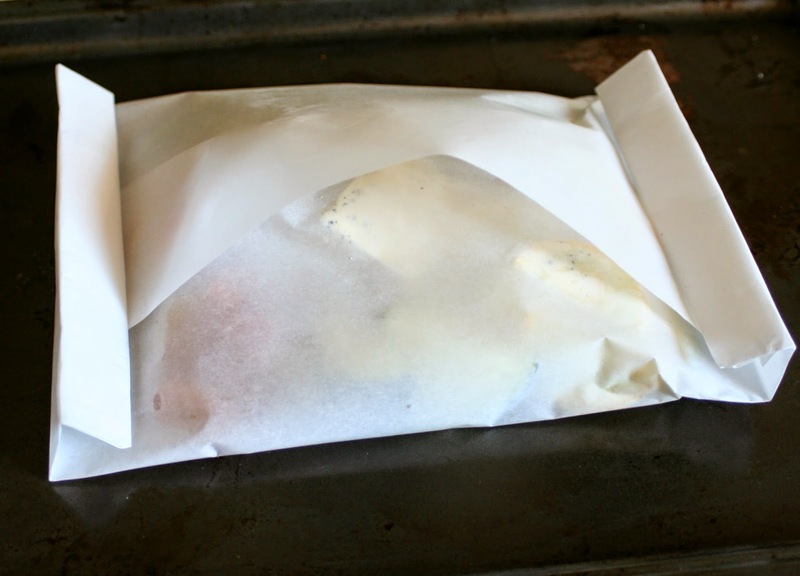 Seal the parchment paper to form a package and stick on a baking sheet. 6. Bake in a oven the has been preheated to 350 degrees for 20-25 minutes, until fish is flaky. 7. Serve either in the parchment paper or remove and place everything on a plate.